It is Saturday when I write this. I've been up all morning and into the afternoon baking. You see, this is a family tradition that some good friends have had the pleasure to enjoy. For years instead of buying something that will end up in a landfill or forgotten in a drawer, I have been baking gifts for friends and family. This one baking stint isn't over yet, I've got more to do tomorrow. I was going to make Fudge, but this isn't winter and it would be a mess by the time it made it to New Jersey. So I baked the Coconut Cookies from this blog. It makes 24 1 ounce cookies, and I am keeping 6 here for myself. I'll have those at work. There's more to bake tomorrow, and it won't be a surprise that it will be my own chocolate chip pecan cookies. No, this recipe I won't share, and there are plenty recipes similar out there. Try the internet cookie recipe it is based off of that but I have tweaked it to make it my own. But I did get to wanting some Anisette Cookies, like when I was a wee brat. Mom would bring these home often enough that I got to think of them as something everyone had. Nope. This recipe is quite similar in taste. I will be adding a little extra Anise Extract since I enjoy a strong licorice flavor from time to time. The taste in this recipe is "Authentic" instead of being a "Kick in the pants". If you came from an Italian family, this is familiar. Wet ingredients - to a stand mixer, cream your butter. Add the sugar and the eggs. Finally add the Anise Extract. Hold back the milk at this time! All ingredients are to be added one at a time, as things incorporate. Mix your dry ingredients in a bowl sifting them together. Using a sifter isn't absolutely necessary, I just tossed it in the stand mixer with all the wet stuff while it was running but you could use a fork in a big bowl if you chose to. Trust me it isn't fussy. Finally, the milk is to be added to the stand mixer one tablespoon at a time. The ending dough will be soft and pliable, but not sticky. Think of that play-doh you had as a kid - Modeling Clay. To Bake: The resulting cookies will double in size and be rather soft inside like cake. 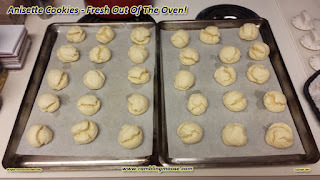 Spoon out 1 level tablespoon amounts into balls on Parchment Paper spaced evenly. I got 15 cookies per "regular sized" cookie sheet, and really they don't get all that big. Bake the Cookies for 10 to 12 or so minutes - they will NOT get golden brown except on the bottom. The resulting cookies will be soft. Oh, and, Sorry Pat, you're only getting about 1/2 of these. They were GOOD!